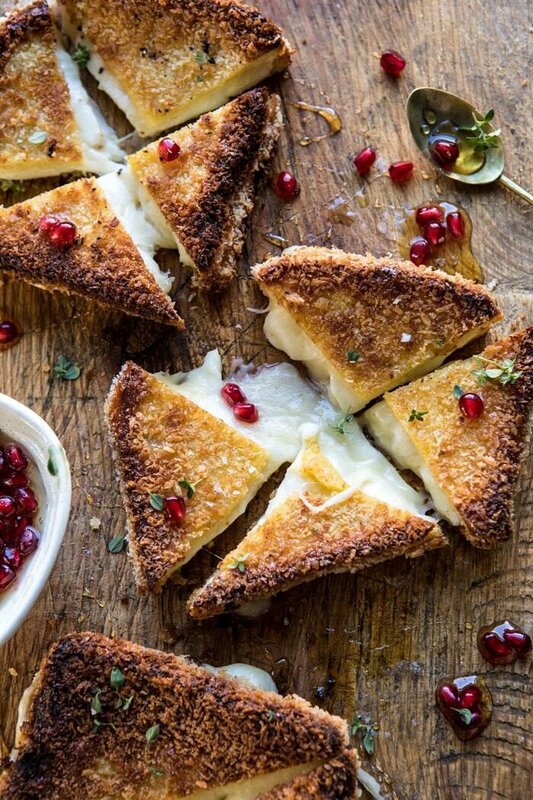 Fried Mozzarella Sandwiches with Pomegranate Honey. 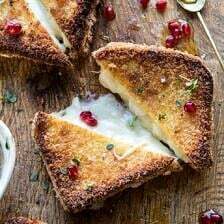 Today I’m sharing my favorite holiday appetizer, fried mozzarella sandwiches with pomegranate honey. Mozzarella stuffed inside soft brioche bread, crusted in breadcrumbs and pan-fried until the cheese is melty and the bread is golden. Finish each sandwich with a drizzle of sweet honey and a pinch of sea salt for a truly mouth-watering experience. 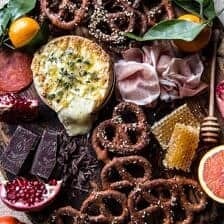 Try cutting these into mini triangles and serve with a pomegranate-honey sauce for the ultimate deliciously festive holiday appetizer. With Christmas Eve just days away, things are the busiest ever. It’s all so exciting and it’s been beyond amazing to see all the recipes you guys have been making. I absolutely love reading through your comments on the blog and Instagram. It’s so special to me that you take the time to send me photos of the dishes you’ve made. Truly makes me so happy, and I love spending time at night going through all the messages. I’ve been trying my absolute hardest to respond to each and every one of you. But I’m still so behind, so if I haven’t responded to you yet, please, please…just keep bugging me! All that said, I cannot wait to see what you guys make for Christmas this year. Do you have your menus set? Are you cooking… or being cooked for? Dying to know what you’re making! I’m hoping you still have room for one more appetizer on your menu. Because all of my family members that have tried these sandwiches were so surprised at how delicious these are. 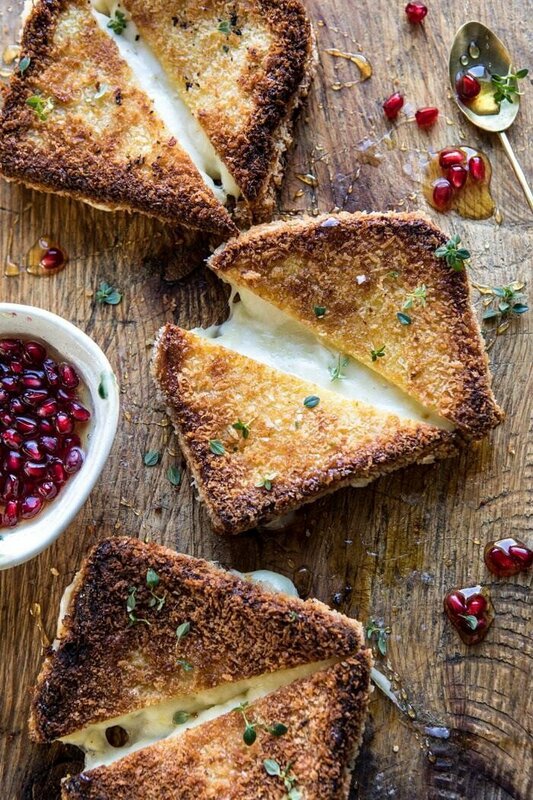 These sweet and savory sandwiches are no ordinary grilled cheese! Let me just start out by saying that these are simply some of the best sandwiches I’ve ever made. 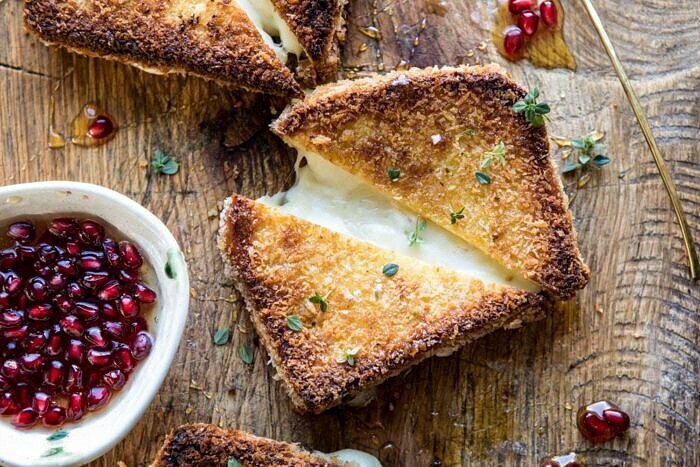 They’re everything you would want out of a cheesy sandwich. They are this year’s Christmas appetizer. Very exited to make these again in just a few short days. Over the last few years, it has become a bit of a tradition for me so share an appetizer on one of the days leading up to Christmas. Appetizers seem to be one of the last-minute dishes we all forget about. So I love sharing something that can be easily created, and is of course, delicious! 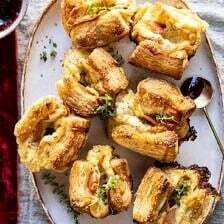 I’ve shared a lot of puff pastry and brie recipes in the past, so this year I wanted to try something a little different. Enter the Mozzarella in Carrozza, also known as the Fried Mozzarella Sandwich. Think mozzarella sticks, but made so much better with the addition of soft bread and sweet honey. Soft brioche bread is layered with mozzarella and Havarti cheese, coated in a Panko/parmesan mix, and pan-fried in olive oil. The sandwiches are then finished with a little drizzle of a pomegranate-honey sauce, and a sprinkle of flaky sea salt. Simple, cheesy, with just a touch sweetness. If you’re in need of an appetizer, you must make these. They’re ideal for a smaller crowd, as you’ll need to pan fry each sandwich. But you can keep them warm in the oven until you’re ready to serve. Then you won’t have to be standing at the stove as guests arrive. I like to cut the sandwiches into mini triangles for easy eating. Then I just serve them up right on the cutting board. These are the best holiday appetizer, and a switch up from the typical. Also? Don’t skip the honey. I know it might seem odd. I also know it’s a little messy, but it makes these sandwiches. Well, the cheese makes the sandwiches, but the honey adds that extra special touch that you guys know I love to include in all my recipes. The honey (and the flaky salt) are delicious. Don’t skimp! 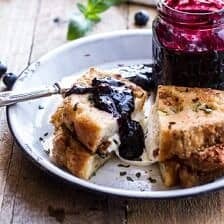 If you make these fried mozzarella sandwiches, be sure to leave a comment and/or give this recipe a rating! Above all, I love to hear from you guys and always do my best to respond to each and every comment. And of course, if you do make this recipe, don’t forget to also tag me on Instagram! Looking through the photos of recipes you all have made is my favorite! Mozzarella stuffed inside soft brioche bread, crusted in breadcrumbs and pan-fried until the cheese is melty and the bread is golden. Finish each sandwich with a drizzle of sweet honey and a pinch of sea salt for a truly mouth watering experience. Try cutting these into mini triangles and serve with pomegranates for the ultimate holiday appetizer that's festive and delicious. 1. Preheat the oven to 250 degrees F. Place a cooling rack inside a baking sheet. 2. Place the bread slices on a cutting board. Evenly layer the mozzarella and havarti cheese. Add the top piece of bread to make a sandwich. 3. Add the eggs to a shallow bowl. Add the Panko and parmesan to a separate shallow bowl. Working in a line dredge both sides of the sandwich through the eggs and then through the Panko, coating all sides of the sandwich. 3. Heat a few tablespoons olive oil in a large skillet set over medium high heat. 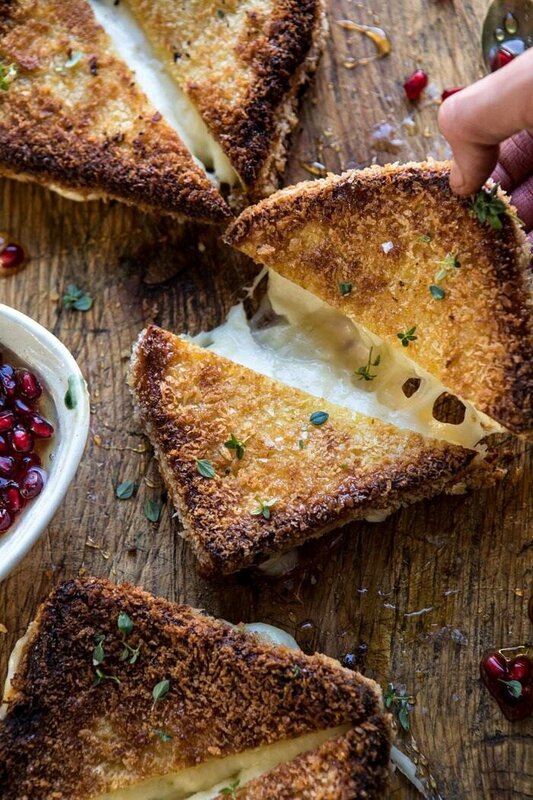 When the oil shimmers, place one sandwich at a time in the skillet and cook for 2-3 minutes, carefully flip and cook another 3-4 minutes, until the cheese is melted and the crust is golden. Remove and place on the prepared baking sheet. Repeat with the remaining sandwiches, keeping them warm in the oven as you work. The sandwiches can be kept in the oven for up to 30 minutes. 4. Mix together the honey and pomegranates. 5. To serve, slice each sandwich into 4 pieces. Drizzle or dip into the pomegranate honey sauce. Serve with thyme and flaky salt. Easy Cheese and Prosciutto Croissants. I have not made a fried mozzarella sandwich for years, we always dredge it in seasoned flour first, then egg, then bread crumbs. Can’t say as I would make it as an appetizer, just do not see it holding up even in the oven. But I do love your addition of honey, my grandmother sometimes served with home made pesto, it is one of my best childhood memories, thank you for reminding me of a favorite food memory, with a Tiegan twist. You want to know what we have been cooking, cookies, cookies- biscotti, lintzer, pizzelle, and many many more, today starts candy making, chocolate covered maraschino cherries, fudges, a new one, peanutbutter and fluff cups that are absolutely devine, coat peanut butter cup molds with chocolate, let sit, add peanut butter, a dollop of fluff, tap mold down, top with chocolate, the cookie/candy box will be full this year. Happy holiday Tiegan you love cooking for your large family as much as I do. Awh I am so glad this sandwich reminds you of one your grandmother used to make! Also, homemade candy.. YES! I love that! Happy Holidays Sue! This reminds me of an Italian breakfast sandwich my mom used to make for holidays. She used Italian bread and mozzarella and it was dipped in egg, almost like French Toast but savory. I miss my mom and her cooking. Thanks for this recipe. I know I will love it. Hi Jade! I am so glad this reminds you of something your mom used to make! I hope you love this recipe! Thank you! Firstly, PLEASE PLEASE PLEASE take a break from responding to comments if you need to – you’re super busy and don’t need the extra stress. Take your time xo. Secondly, I’ll be hosting dear friends and family here in Cleveland (of course) for a Christmas Eve dinner party – honey-baked ham and roasted roasted vegetables galore, along with White Chocolate Gingerbread Blondies. Thirdly, this sandwich creation you’re sharing is SO fun! You always create the perfect twists to recipes/flavor combinations. Hi Liz! Thank you for this. I love how understanding you are! I hope you have an amazing holiday season and that Christmas Eve dinner sounds so yummy! SOS!!! I apologize in advance that this is not related to today’s post. Please forgive me. But I am having a crisis with one of your recipes in the cookbook! Today I decided to try my hand at the apple ricotta pancakes. Honestly, I was not thrilled about needing to use 3 large bowls to prepare them. But, I sucked it up. 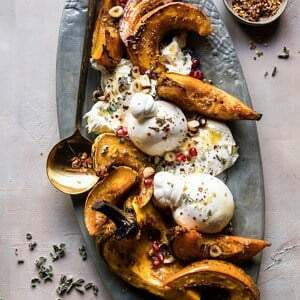 After I poured my first batch into the pan, I realized: The recipe told me to whip the ricotta and the cream and set it inside the fridge until ready to use. There was no further instruction after that! So I frantically folded the mixture into the batter and started my second batch. Dumb idea probably. But still. The batter just didn’t seem to fully cook after that. Very disappointed 🙁 Love the concept though, will probably just do my trusty old buttermilk recipe and do your apple trick on top. Hey Kristen, I am so sorry you had trouble with the pancakes. The whipped ricotta that is reserved in the fridge it meant for topping the pancakes after cooking and is not meant to be folded into the batter. Does that make sense? Hope this helps! Thank you so much Kristen! I hope you do give them another try! Thank you so much and Merry Christmas! 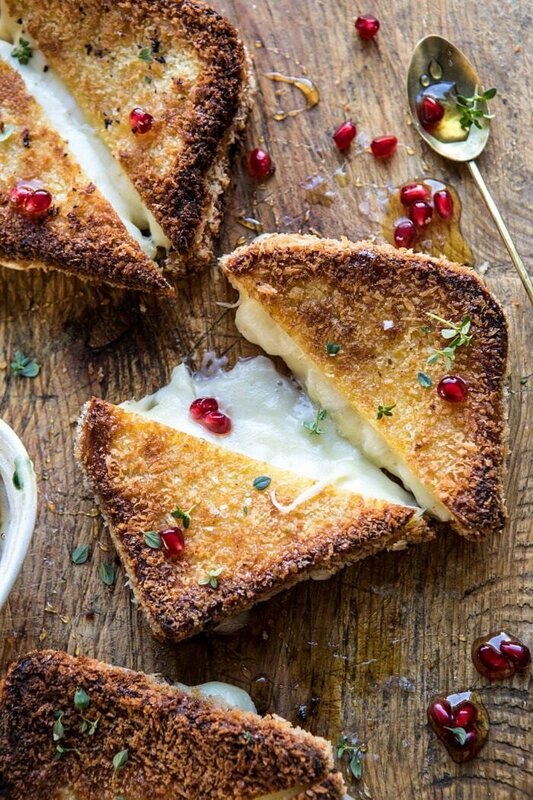 These sandwiches are perfect, I love the pomegranate honey! SO BEAUTIFUL! Love everything you do! I am so glad you loved these and they looked wonderful as well! Thank you so much for trying this recipe, Anna!